Above is an update on the data first presented in Weinkle et al. 2013, courtesy of Ryan Maue (@ryanmaue). 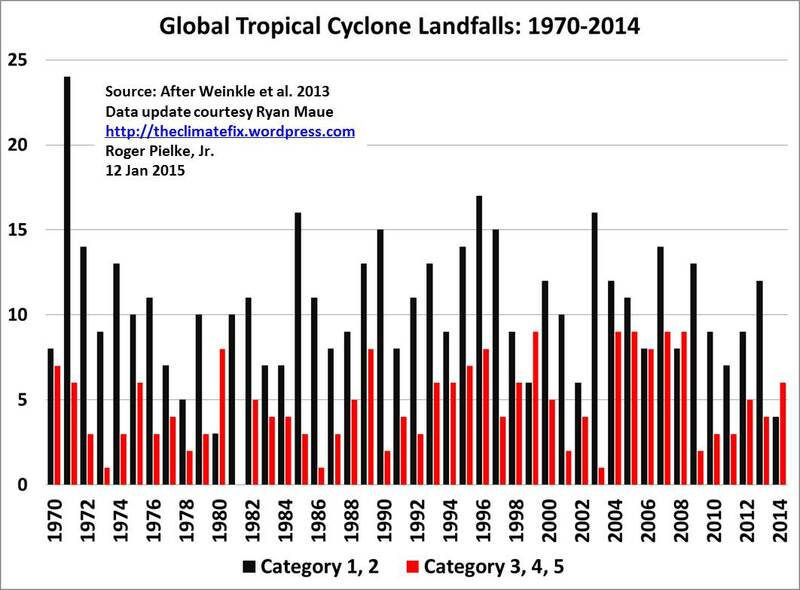 The graph shows the number of landfalling tropical cyclones worldwide for 1970 through 2014. The data is broken down into weak (S/S category 1 and 2) and strong (S/S categories 3+) storms. For the definition of a landfall and other methodological details, please see the paper. 2014 had 10 total landfalls. This is second lowest (tied with 4 other years) since 1970. The lowest was 1978 with 7. The past four years have seen 50 total landfalls, the lowest four-year total since 1982. 1978-1981 had the lowest, with 41. The annual averages over 1970-2015 are: 15.3 total, 10.5 Cat 1&2, 4.7 Cat 3+. If you are interested in more data on global tropical cyclone activity, please visit Ryan Maue’s Global Tropical Cyclone Activity page. From that page, below are trends in all tropical cyclones of hurricane strength, not just those that make landfall. Above are some graphs for those of you interested in the remarkable, ongoing drought in intense hurricane landfalls in the US, which is stretching close to 10 years. The top graph shows the days in between intense (category 3+) landfalls in the US since 1900. 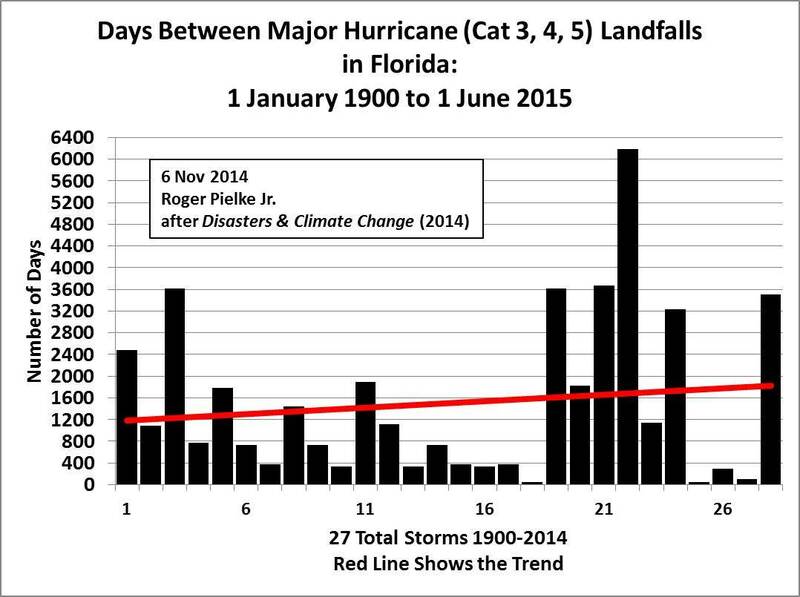 The bottom graph shows the same information, but only for Florida landfalls. 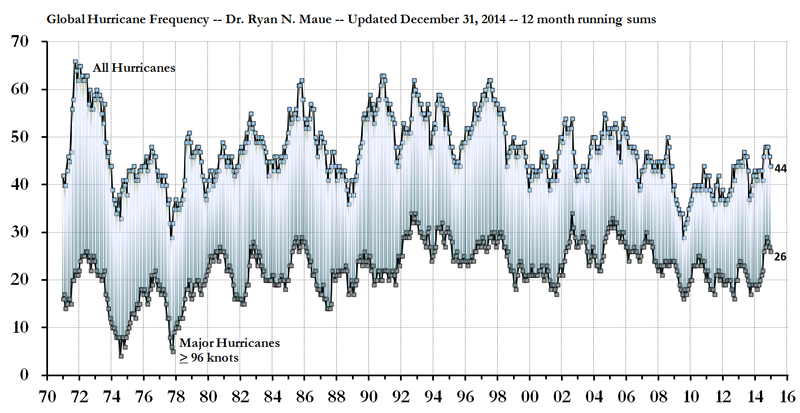 You can see that for the US, the current “intense hurricane drought” is unprecedented in at least a century. For Florida, there have been other long stretches between intense hurricane landfalls. Over the past century the average time between intense landfalls in Florida has just about doubled, from about 3 years to 6 years.